Members of the public are to be asked to take in NHS patients recovering from operations so they can recuperate in their spare bedrooms. You’ll get £50 a day for the use of your room so long as you can offer three microwaved meals a day. You won’t get extra for offering TLC (tender loving care), but you will be expected to converse from time to time with your temporary hospital house guest. No medical experience needed. You can set your own visiting times for guests and relatives (or just state no visiting allowed). One campaign group against the new idea warned that it, “opens a huge can of worms for safeguarding, governance and possible financial and emotional abuse of people at their most vulnerable time”. What next? Scrap ambulances and call Uber instead? You do knitting? That means you’re familiar with needles! You can offer flu jabs in your front living room. The NHS will pay you £2 a shot. Great. That’s the poor sorted. 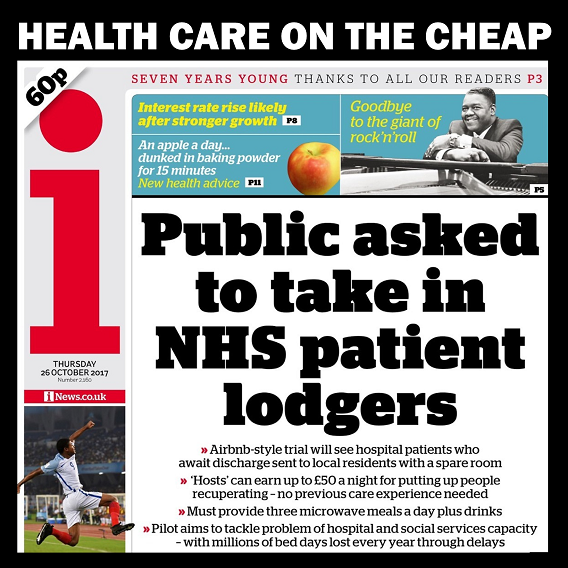 (The rich have already got BUPA – the Bourgeois Ulcer Prevention Association). NHS? Now called National Health Scandal. Angry, upset, disappointed? Don’t worry. Your next door neighbour now offers counselling.